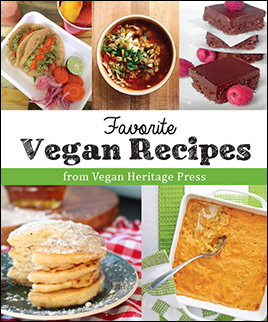 As a publisher of vegan cookbooks, the only thing I enjoy more than producing great cookbooks is eating great meals from the recipes in them. 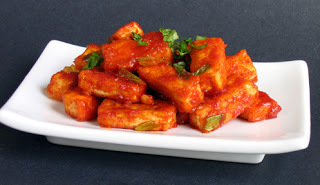 One of my all-time favorites is the Red Hot Chili Tofu from Vegan Fire and Spice by an acquaintance of mine, Robin Robertson. This recipe is in regular rotation at our house, and with good reason: crispy golden tofu coated with a spicy red sauce — what’s not to like? In fact we just had it again this week, but forgot to take a new photo, so here’s a pic we already had. The “red hot” in the recipe title refers to the color as well as the heat, but like most of the recipes in Vegan Fire and Spice, Robin has designed it to be as “spicy as you want it to be.” The basic recipe calls for one teaspoon of chili paste as a starting point, but since we enjoy extra heat, we usually double the chili paste, or add an additional layer of heat, somethimes by adding fresh chiles, other times, a little sriracha. This recipe makes just enough sauce to coat the tofu, but we like extra sauce, so we usually increase the sauce ingredients. Here’s the variation we’ve been using lately. Serve this over rice or quinoa, or toss it with cooked noodles and vegetables for an addictive meal. For best results, use a nonstick skillet to cook the tofu. This recipe is adapted from Vegan Fire and Spice: 200 Sultry and Savory Global Recipes by Robin Robertson (copyright © 2008), Vegan Heritage Press. In a small bowl, combine the tomato paste, water, soy sauce, sake, and sugar. Mix well and set aside. In a shallow bowl, combine the cornstarch and salt. Dredge the tofu strips in the cornstarch mixture, shaking off any excess. Heat 1 tablespoon of the oil in a large skillet or wok over medium-high heat. Add the tofu in batches and cook until golden brown. Transfer to a platter. Heat the remaining 1 tablespoon of oil in the same skillet or wok over medium-high heat. Add the scallions, garlic, ginger, and chili paste, and cook, stirring for 15 seconds. Add the reserved tomato paste mixture and stir until well blended. Add the reserved tofu and toss gently to coat with the sauce, cooking until heated through, about 2 minutes. Serve hot, sprinkled with cilantro.